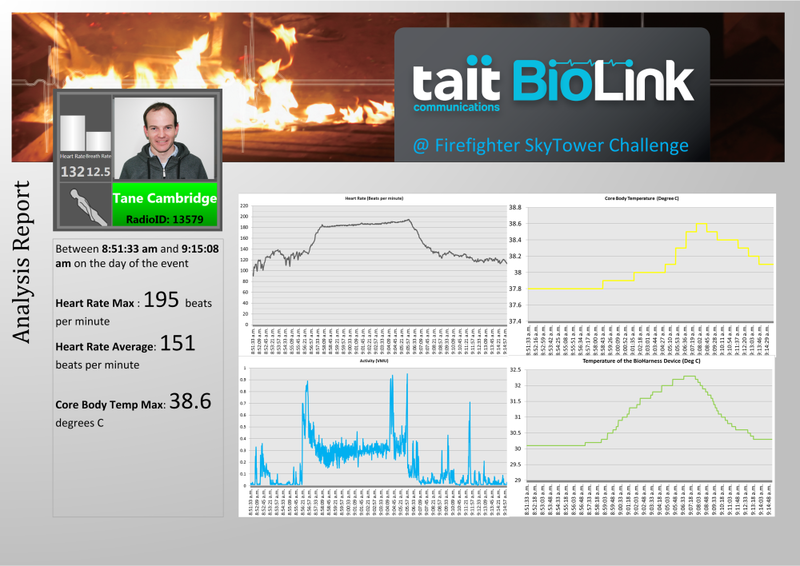 Friday night after work I jumped on a plan and made my way up to Auckland for the Sky Tower Firefighter Challenge. As I flew in to the airport I caught my first glimpse of the Sky Tower out the plane window. A short time later and a bus ride into town got me closer to the tower which was quickly standing there waiting patiently for Saturday’s challenge. 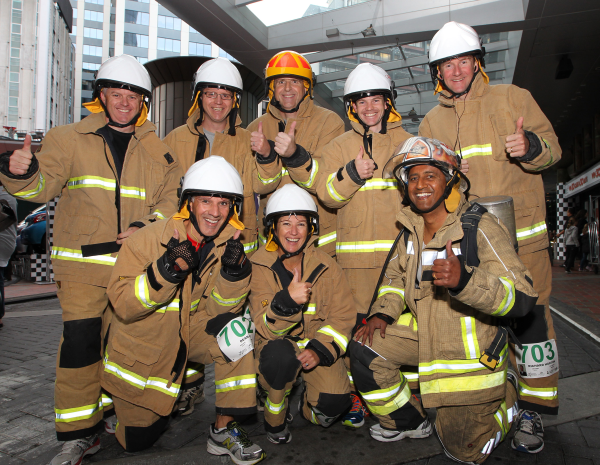 Saturday morning started early, by the time I emerged from my hotel room to the base of the Sky Tower there was already a hive of activity, firefighters, helmets, Breathing apparatus and other gear everywhere. I meet the rest of Squad 7, our brigade of non-firefighters which comprised of a TV3 reporter, and a couple of company CEO’s and other “big wigs”. After seeing the first few runners it quickly became time to suit up. We were corralled into a back room and presented our gear, complete with named helmets! I started up my Bio-link harness and got it running on my phone so that my vital signs could be monitored remotely back in Christchurch. Our “guide” had some tips to get us going and helped us get our gear on so we were wearing it correctly and comfortably. There was time for a photo, then after signing a waiver we entered the building and proceeded down the stairs into the basement. Already lined up and ready to go was the next squad of firefighters which we had to walk past to get to the start. I must admit it was just a little bit intimidating passing those guys on the stairs! There was a very short amount of time before starting to get nervous and my Heart rate got up to 140bpm just standing there. I managed to calm myself down a little bit before starting, and thankfully I was underway quite quickly. I took off fast, double stepping with all that adrenalin pumping. I quickly got up the first two flights to ground level, and managed to jog comfortably around the base of the tower before heading straight up the guts of it. It took a few flights and the heat began to build and I could no longer maintain a jog. I moved into a fast step mode, and very soon caught the 1st squad 7 member who started 30s in front of me. I got into a good rhythm and just focused on the steps in front of me. I ignored the pain, and instead just kept going reassuring myself that it wasn’t as hard as Avalanche peak as it was all going to be over in 15mins! As I got closer to the fire refuge I started to pass more and more firefighters in full apparatus with it started. I knew I was past halfway when I could hear the BA’s whistling to tell the firefighters using them there were beginning to run out of air. Bursting out into the fire refuge was a welcome break to the constant climbing and I managed to break into a little jog. I got a little bit too excited and double stepped the first flight, before quickly reverting to a measured climbing pace for the final 10 or so stories. I spotted the 48th floor marker and knew it was only two flights to go, with the encouragement of some of the other firefighters I pushed hard right to the last step. Suddenly It was just about all over and a short sprint to the finish line and some welcome relief from the heat! The support crew were really well practiced and they quickly striped us down, gave us a seat and water for a bit of recovery time. I was able to sit and enjoy the view while I waited for the rest of Squad 7 to arrive at the top. Once we where all there it was photo time and then a very quick trip down the lift to the ground floor and it was all over. I really enjoyed the race and given the chance to do it again I would be back no hesitation! I managed to slip under 10 minutes in 9:41, the fastest in our Squad 7 (non-firefighters) Category and the “Donned” (Full gear without mask) category. The fastest overall time was with the full breathing apparatus, breathing air from the mask (Donned and Started) completing the race with an impressive new record of 8:37. Thank you to all those who donated, I got up to $1380 towards Leukaemia & Blood Cancer New Zealand before the race on Saturday. With the help of the Tait Communications and the other sponsors all of the $471,000 raised will go towards the patient and support services offered by Leukaemia & Blood Cancer New Zealand. All in all a good day out!